On my journey through grief, I ran into so many unexpected things. It is overwhelming enough to deal with the sadness you expect after the loss of a loved one, but I think it is even harder to deal with the many unexpected aspects of grief. One of the things that took me by surprise after the death of my husband was the loss of my couple friends. Perhaps loss is not the right word—they were still there. But as time went on, they started to drift away. That was so painful for me, but yet, as my grief counselor said, it was normal. As she bluntly put it, “You are not a couple anymore.” As hard as that was to hear, it helped me realize that to get my life back on track, I was going to have to deal with life as a single person—not as part of a couple. For a while, my couple friends tried to be nice and include me in their dinners and get togethers. But I felt like a fifth wheel and as the months went by, they stopped asking me to be part of their gatherings. Sadly, what we mostly had in common was gone. I used to enjoy conversations about husbands and what they were doing, but now I had nothing to add. I no longer had a husband to talk about. For so many years, much of my identity had been as part of a team. My husband and I discussed and worked on our plans together. I had to start formulating plans for life by myself. I heard a line in a movie that became very meaningful to me. “I can live without you. I just don’t want to.” As painful as it was, I had to learn to live alone, even though being single was never anything I planned for or wanted. But the simple fact was I couldn’t go back. I knew I had to find a way to be happy again. 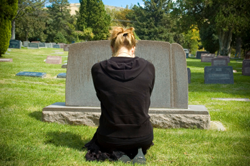 I didn’t want to be the widow who sat around and cried about her loss forever. I had always had my own interests, but after my husband Sid died, I just didn’t have any enthusiasm for anything. It took a while, but I began forcing myself to take one little step at a time by picking up some of my old hobbies. It was also helpful for me to take up new interests. A neighbor suggested I take dance lessons, so I did. Stepping out of my comfort zone enabled me to feel better about myself in general. It also offered me something to look forward to, as well as the opportunity to meet new friends. I had lunch with other widows in my support group, and tried to go places—like singles groups– to meet other single women that I could socialize with. Although it was very uncomfortable at first, I slowly began to see that my identity as part of a couple was disappearing. As my circle of friends shifted, I began to feel more relaxed in my new role as a single woman. I would always be a widow, but my focus had to be positive, instead of negative. I remember the first time I really felt like a single person was at a family wedding. When the bride threw her bouquet, I realized that if I wanted to—I could stand behind her, too. As silly as that might seem to others, it was an acceptance thing for me. I wasn’t a couple anymore and even though it was still hurtful—I could handle it. Another widow friend said to me, “Life changes around us all the time. So we can either change with it, or get left behind.” That is so true—it hurts and it is hard, but we have to make the transition from being part of a couple to being alone and being okay with that. It didn’t happen overnight, but each labored little step I took brought me closer to a new life as a single person. I feel like, in order to heal, we have to finally accept certain very difficult realities. And for me, one of them was to come to grips with the fact that I was not a couple anymore. Dear Melinda, Thank you for your words. Being a member of the same “club” it really hit home as I remembered how our couple friends dropped away, and how surprised I was. My family is scattered throughout the country, so it was me, my cats and my close women friends who were a telephone call away. My support system manifested through a bereavement group, dabbling in the expressive arts, and opening up to my spirital (not religious) core. My sons returned to their lives, their families as the should have. They were dealing with their own sense of loss, and just wanted to believe that mom is a strong woman and she’s ok. There was no way for me to explain to them what my loss felt like, I was too raw and confused. There were many times, especially during that first year, that I experienced intense sadness when I attended a family function without my husband at my side. I felt off balance and out of place. At one of these events, I retreated to an upstairs bedroom and wept because I was so used to looking across the room and catching Marty’s eyes,his grin and feeling the comfort of belonging. When i looked up, there was no one there…I was alone in a crowd of family.